I have read this book late. 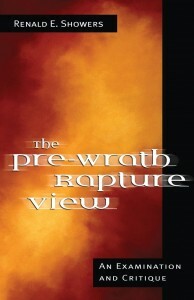 Showers wrote this in 2001 and the pre-wrath view of the rapture came into voque in 1990 with Marv Rosenthal’s The Pre-Wrath Rapture of the Church, and in 1992 with Robert Van Kampen’s The Sign. I read them at the time but now have reason to study the view again. Showers does his usually good and thorough job of critiquing and answering this errant rapture view. In short, the view sees the rapture happening three fourths of the way through the seven-year tribulation period. The view only sees the final seven bowl judgments as the “wrath” of God, and the church has promised deliverance only from this wrath, not the earlier times of tribulation. It is a view that falls between a mid-tribulational and a post-tribulational rapture.